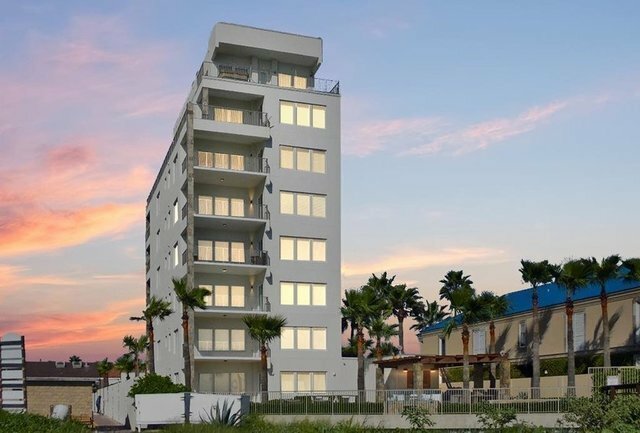 Exclusive, modern residence w/ upscale amenities on the beautiful beach of South Padre Island. Only 7 units in this building; each has covered carport parking plus private garage with guest room and bath over garage. Luxurious beachfront pool with pergola, outdoor kitchen, large screen TV, and piped music. The elevator opens to the foyer of your home where a giant great room with spanning picture windows surround you with views of the Gulf of Mexico. The great room has an additional entertainment bar with cooler. Step out to a spacious, covered beachfront balcony. There are five bedrooms with ensuite baths, plus a half bath and an office/den. This is rare opportunity as homes in this immaculate building do not come available often.